Four of these have been powering a construction site including all the tools (skil saws, table saws, compressors...) in Lunenberg, with a 2.5kW inverter from Outback and a 1800 Watt solar array on an outbuilding. The only time they had to use a generator was when they were blowing in cellulose. See our Facebook page for a full discription. Surrette Battery Company in Spring Hill Nova Scotia produces world-class batteries and ships them globally. Some people pay increased prices to cover shipping and brokers. Here in the Maritimes we are able to buy direct and pass the savings along to you. We provide shipping for larger orders. For individual batteries we can arrange customer pick-up. 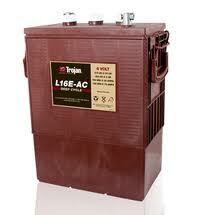 These batteries are excellent for smaller cottage systems. 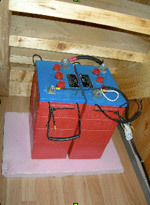 Please contact us for larger batteries.